TALLAHASSEE, Fla. – Florida State’s offense plans to pick up the pace during Saturday’s visit to Syracuse. And the Seminoles’ defense is hoping to join the party, at least in a sense. Because after a pair of uneven beginnings in games against Virginia Tech and Samford, defensive coordinator Harlon Barnett has made flipping that script his top priority. And against what better opponent? While it has yet to translate to the ACC standings, Syracuse under coach Dino Babers has built a reputation as one of the most explosive – and fastest – offenses in the country. The Orange led the nation in average plays per game last season (87.8), and, after games against Western Michigan and Wagner, is trending above that average so far this year. Along the way, Syracuse scored 55 and 62 points in back-to-back weeks, good for sixth nationally in scoring offense. More importantly, the Seminoles are trying to be ready from the opening kickoff. While FSU’s defense has been impressive in spurts, those spurts have mostly come after some mid-game adjustments – and after the Seminoles have fallen into an early deficit. 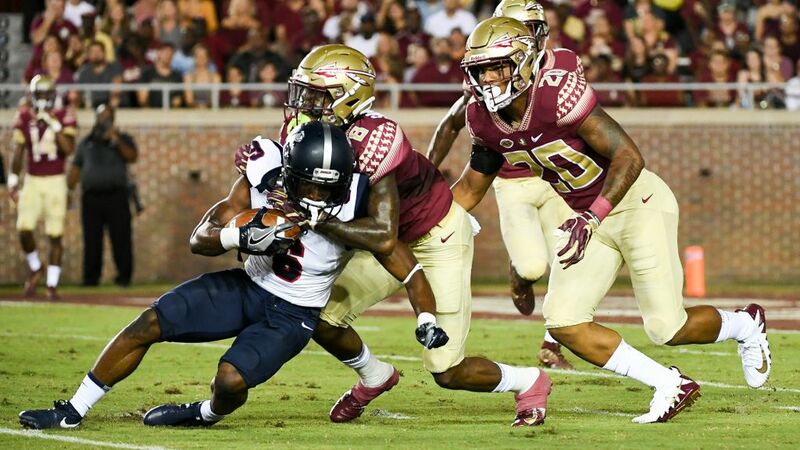 Both Virginia Tech and Samford scored on their first possessions – and Samford on its first play – and although things tightened up after that, the Seminoles still spent the rest of those games playing catch-up. Consider that, after scoring a touchdown on its first drive, Virginia Tech’s next nine possessions went for a combined 130 yards and three points. And after going into halftime with 23 points and 341 total yards, Samford managed just 184 yards and a field goal for the rest of the game. “It just took us a little bit to get into our groove against Samford,” linebacker Dontavious Jackson said. The idea, then, is skip those early struggles and get straight to the good stuff. That could be imperative against the Orange, which has one the ACC’s top quarterbacks. Senior Eric Dungey has thrown for 47 touchdowns against 22 interceptions for his career, and, at 6-foot-4, 226 pounds, is a powerful threat to run, as well. The only thing slowing him down has been health. Dungey has dealt with a multitude of injuries, including a broken foot that he tried to play on last year in Tallahassee. With Dungey in the lineup, the Orange scored three touchdowns and racked up 387 yards of offense. Without him, it managed 79 yards and three points. FSU sealed a 27-24 victory when it blocked a last-second field-goal attempt. “In the run game, he makes you have to defend 11 guys instead of 10,” Taggart said. “And then he can throw the ball as well to some of these skilled receivers out there. There is, however, good news for Florida State, too. After two weeks of an unusual routine – first in preparation for a Monday game against Virginia Tech, and then a short turnaround for Samford – the Seminoles are currently in the midst of their first normal game week. Which means rather than two full practices, which is all they had leading up to Samford, the Seminoles will practice four times before boarding their plane for Syracuse. “It’s more time for game-planning, more practices,” defensive tackle Fredrick Jones said. And when they are practicing, the Seminoles are going against an offense that runs a hurry-up, no-huddle system that’s at least similar to what they’ll see on Saturday. That’s in stark contrast to years past, when FSU used a slower, pro-style offense. The Seminoles’ scout team did their best to replicate Syracuse’s pace, but it just wasn’t the same. This time around, having joined the hurry-up trend, the Seminoles feel they’ll be better prepared to play fast. And maybe start fast, too.